this RPSF/RPF SI jobs through Railway recruitment board. Closing date for this RPSF/RPF SI Recruitment is 30-06-2018. Available vacancies are RPF SI Exe, RPF SI Band. Selection for this RPSF/RPF SI Exe/Band jobs recruitment will be based on Written Exam, Physical Standards Tests and Physical Efficiency Tests. 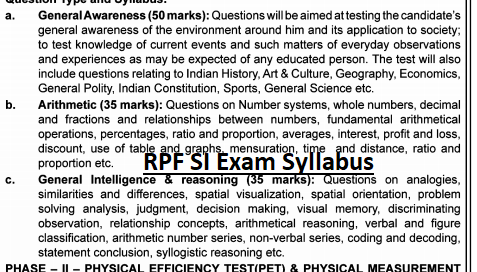 Those who are qualified written exam they are only eligible for physical tests of PET/PST of RPSF/RPF SI jobs. For RPF SI Band jobs a trade test will be conducted. Those who cleared Physical tests, Trade Test (SI Band) they are only eligible for documents verification. Computer Based Test CBT will be conducted for SI Jobs in RPSF/RPF recruitment 2018. 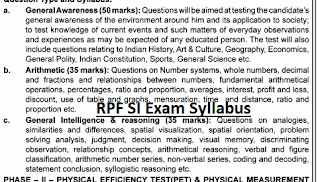 Exam Pattern and Syllabus topics for this SI Exe, SI Band jobs of RPSF/RPF recruitment lare given below. There are total 1000 vacancies available in Railway Police Protection Force RPSF/RPF department Recruitment notification. Category wise and Battalion wise RPF SI vacancies will be updated soon. For Ex serviceman wise RPF SI vacancies will be updated soon. For SI Band-Potential Band Masters Course or Equivalent Music Instrument which is equal to Degree. As on 01-07-2018 for the general age limits are 20-25 years. For Ex Serviceman as per the norms. Selection for this RAILWAY SI Exe/Band recruitment is in different stages. Initial pay is Rs.35400/- level 6. CBT Online Written exam will be held for this RPSF/RPF SI Exe/Band vacancies. For SI Jobs Exam paper level or exam syllabus will be Degree level only. Syllabus will be updated soon. Candidates who are looking for these Railway SI Exe/Band jobs they can apply online on or before 30-June-2018 through www.indianrailways.gov.in website. Click here to apply online for the Railway Police SI Exe/Band Recruitment 2018. 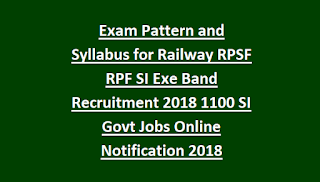 Clickhere for Notification of Railway SIExe/Band Jobs of Recruitment. 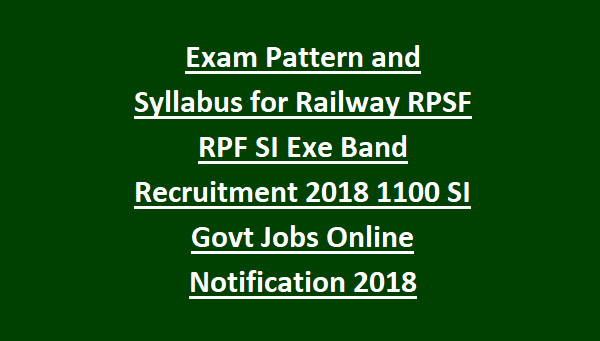 Please share this RAILWAY SI Exe/Band Recruitment 2018 article to your lovable friends through FB or G+ or Whatsapp.